Jiyoung Chung drew me into the gallery. I met her through Art xChange and her mother Chunghie Lee at a show there in 2014. In 2014, I first attended the Bojagi conference they regularly coordinated on Jeju Island, part of a trip to Korea I made that year. Subsequently, I went to Gwangju where I exhibited work and met for further conferences. Jiyoung works in the joomchi tradition of Korean paper art. 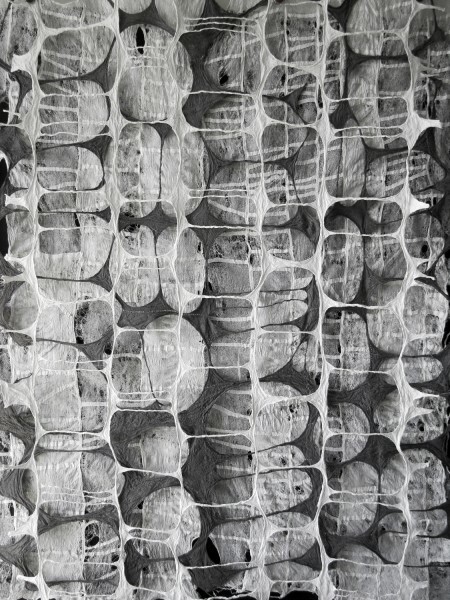 The new work, Between and Within expounds the brilliant technique of layering sheets of hanji, Korean mulberry paper, in black, grey and white. In the Seasons in Life series, she uses torn joomchi, in black, white and red. These works reveal the potential of this phenomenal material in a contemporary language. Hanji is a very strong, renewable resource, and its traditional use for building materials, clothing and armor demonstrate the capacity of its ingenuity. Chung’s skill as a manipulator of this material appears in Between and Within as she has pushed and pulled the deceptively delicate paper (these sheets start thin) into fanciful grids, then overlays them. Her time consuming process requires strength and determination, resulting in organic insights. Joomchi also requires no adhesive; when wet and pounded, the paper will stick to itself. Process is revealed. Jiyoung Chung Between and Within, joomchi, 29" x 42"
Drawn in by Jiyoung Chung’s work, I explored the lithographs of Jeju artist Gilchun Koh. Exquisite renderings of birds which appear on the island are accompanied by corresponding feathers which Koh collects. 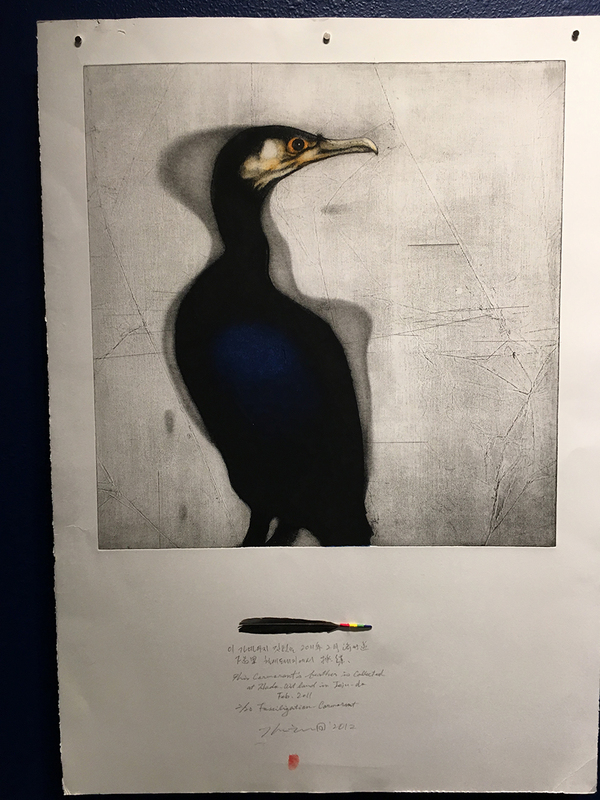 The prints evoke a scientific context of specimens and animal residue collected by a trained and affectionate eye. 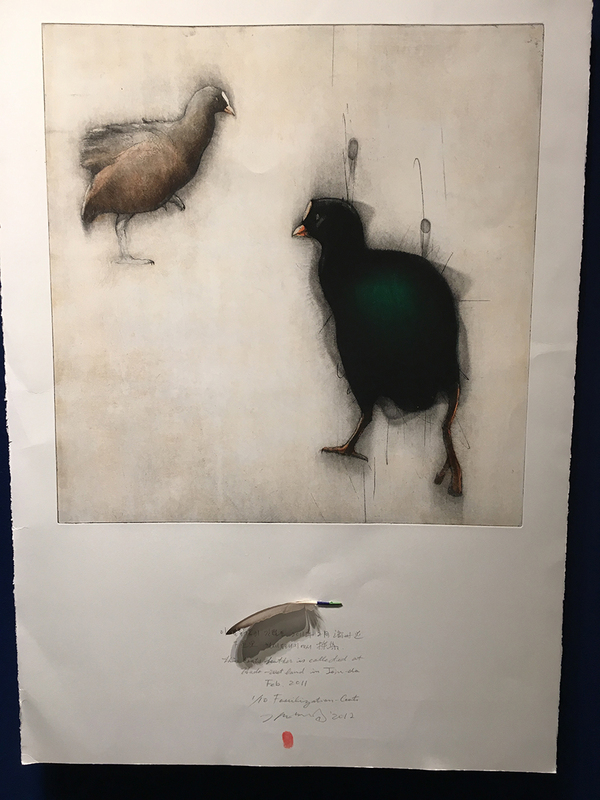 What excited me was a recent series, Fossilization, where Koh lays down the texture of stone with its cracks and scraped ridges, then renders the coot or cormorant with a shadow, suggesting the way a fossil might appear. There is a clear reference also to the work of Audubon. Koh views these images as the animals in the process of becoming part of the sedimentary rock, ultimately only visible as fossil data. The cormorant or coot will have long since disappeared because the speculations of vacation home development as well as, probably, military base construction have reduced the land available to these migrating birds. I appreciate Koh’s approach to Fossilization. He has long worked in these bird prints, the older ones from about 2003. This series, however, documents the changes to the Jeju landscape through the rendering of the birds. He refers to the considerable commercial development in his statement, but my own visit to Jeju-do and subsequent following of Korean politics shows the resistance to a submarine base in the midst of an undersea wildlife refuge at Gangjeong village between 2007 and 2017, still modestly continuing until today. The island’s history for many years in the late 20th century was dominated by artists, farmers and exiles. There was plenty of land for wildlife, but in the anthropocene, even common birds such as cormorants and coots are impacted.